Modern journalists are low-paid losers. The industry is based on an illusion and working conditions are brutal. Since the advent of the internet not many people are believing them anymore. The industry runs on sensationalism. It’s all underpinned by cultural Marxism. And it’s filled with backstabbing sociopaths. Sounds like fun! Then today over at Danger & Play, Mike has revealed that his retweeting of a tweet from an editor at Vox got the editor fired. The tweet in question was an incitement to riot if Trump came to your location. It seems that advertisers did not take kindly to the attention this received. Pretty stupid behavior from someone who is supposed to be a news editor. But that’s the point – if you’re in mainstream media today it’s because you either took a frontal lobotomy or you have a brain the size of a peanut and the ethics to match. Journalists no longer have to complete a cadet-ship to learn the job. They go to a “university” where the chances of failing are less than zero and where they are brainwashed into the latest and greatest leftist causes. Yes, I do notice something. They’re all children. They are there because they are poorly paid, they will do what they’re told, and they are full of zeal. But where are the editorial board from five years ago? Well, once they started earning money and living in the real world they realized just how much they were being taken advantage of, they began asking difficult questions, and they subsequently lost their zeal. Only the one remaining true believer is in the foreground. In another five years it will be repopulated by the ranks of dimwits currently protesting on college campuses against “micro-aggressions” and the like. You would think that maybe just one of those girls in the photo might glance around and wonder why everyone is so young. 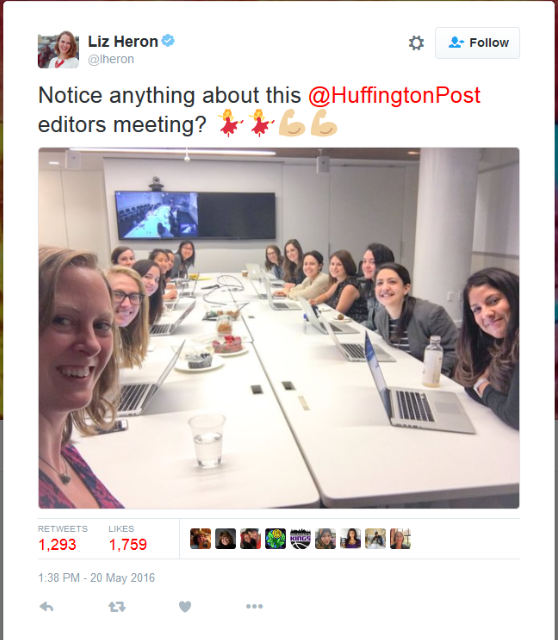 And then maybe wonder where the older editorial staff are and what happened to them. And then put 2 and 2 together and realize that she was on a hiding to nothing. But no, that would take introspection and an ability to think. Twenty years ago if a journalist wanted to interview you it meant something. You took it seriously. Now? Pffftt. Oh please. What the hell do these imbeciles know? Even if they had your best interests at heart they’d still get it wrong. Trump has done what no other person, let alone an electoral candidate, has done – he has attacked the media and he has laughed at their collective ineptitude. By attacking the media he has attacked Clinton because they are on her side. Whatever side the MSM takes is the wrong side. They are like a barometer for dumbness. Should Britain exit from the EU? Well, what do the MSM think? Oh look, they’re all in the Remain camp. That means that Britain should leave. What about global warming? The MSM reckons that it’s terrible and something must be done. Okay, so no real issue with global warming then. Gay marriage? The MSM thinks that is an absolutely fantastic idea so in actual fact it’s pretty freaking terrible. How about illegal economic migration of illiterate and diseased Africans to Europe? They couldn’t possibly think that this is a good idea, could they? Could they? The only way to approach modern MSM is with haughty disdain. These people are stupid at best. They have no life, and their entire industry is going down the shitter as Cernovich is demonstrating almost every day. Maybe we should get a new world day going – Laugh at a MSM journalist day. Hello debt, my old friend. I considered a career in journalism when choosing my path in the late 1990s. I chose against it just because it was tricky to get into. How lucky am I? Today people like us can pontificate all we like on our blogs and in self-published books, no media required to mediate our message. Great article, and not just because of my bullet points. The MSM is the only group that takes the MSM seriously anymore. The average age in the TV news room now in a major city I worked in is probably 25. Young, usually white, brainwashed, YouGoGrrl, attention whoring SJWs and effiminate men. I came to truly despise the industry before I left because I am exactly the type of person they want to destroy: the straight, white male from a Christian background. I fled the U.S. to take a stand, my tax money and productivity will NOT be used by the system for my own destruction. The MSM is the only group that takes the MSM seriously anymore. Yeah, that’s a really good point – they’re just writing it for each other, for peer approval and their next job. Great article Adam, and the experiences I have had with the MSM prove everyone of your points.